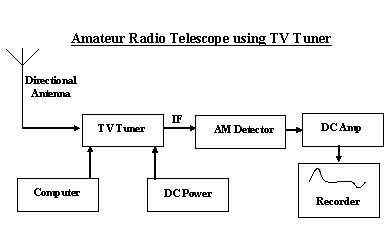 The CATV Television Tuner sold by MTM Scientific, Inc can be used to build a simple amateur radio telescope for exploring radio astronomy. The CATV Tuner will easily receive the frequency bands of 406-410 MHz and 608-614 MHz (UHF Channel 37) which are both recognized bands for making radio astronomy observations. The TV Tuner is especially useful for continuum radio astronomy in these bands because it has a large IF bandwidth. This project was inspired by amateur astronomer Bob Sickels, who suggested using television tuners for radio astronomy in his "Radio Astronomy Handbook". (Available from Radio Astronomy Supplies via the link below.) Please Note: You can get a quick start on this project by using our CATV Tuner Motherboard, available on our main CATV Tuner Page. The Tuner can be controlled via the parallel port of your computer, exactly as described for the FM Wideband Receiver Project. A good plan might be to build and operate the Tuner as a simple FM receiver first, before moving on to this Radio Astronomy project. However, for a fast start the best option for controlling the tuner is with a PICAXE controller, as described on our PIC Project Page. The PICAXE method is how our CATV Tuner Motherboard Kit works, which can be purchased for a really fast start on this project. A frequency specific directional antenna is required for making radio telescope observations. There are several good options available. The Society for Amateur Radio Astronomy (SARA) has published detailed plans on the web for building a QUAGI Antenna for 408 MHz. Another idea is to design your own YAGI antenna using the free computer software program 'Quick Yagi'. We have provided links in the Resource Center (below) for both those options. Another option is to use the free plans we have published for building a YAGI Antenna: YAGI Plans. We also offer an opportunity to purchase the brass and aluminum antenna elements on that page. For Radio Astronomy the usual approach is to build the YAGI Antenna for UHF Channel 37 (608-614 MHz). The YAGI antenna works well for drift scan observations and is a good way to get started in the hobby. The Automatic Gain Control (AGC) on the Tuner must be disabled for the radio telescope project. This is most easily accomplished by connecting a wire to the first pin on the 4 pin connector that connects the VIF unit to the Tuner. Run the wire to +12 VDC. Here is a photo of the modification. Note that the sheet metal covers have been removed for the picture. 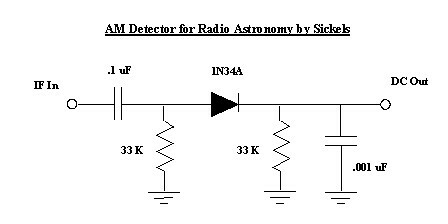 An AM Detector is needed to convert the IF output signal of the tuner to a DC signal for amplification. A simple diode detector can be used for this frequency range. A suitable detector circuit is shown here from the "Radio Astronomy Handbook" by Sickels, courtesy of Radio Astronomy Supplies. The detector is sensitive to ambient light, so be sure to cover it with black tape or an enclosure. Instead of building a detector circuit, some hobbyists have simply measured the voltage from the AFT output on the LA7577 chip (Pin 14) in the VIF unit for monitoring the signal. A DC Amplifier is used to amplify the small millivolt signal from the AM Detector. It is possible to build a very nice single supply instrumentation amplifier using a single IC, such as the Burr-Brown INA122. A single external resistor sets the gain from 5 to 200. Here is a link to a circuit diagram and source for the IC amplifer: DC Amplifier Circuit. A data recorder is used to collect and store the signal from the radio telescope. One good option is an inexpensive data acquisition module, complete with software, that is available for about $29 from DATAQ. It is their DI-194 "Starter Kit". The DI-194 data acquisition module attaches to the serial port of a computer. The WinDaq software provided with the module creates a real time graphical display of the data which simulates a strip chart recorder. (See the Resource Center) Another option for recording the data is to build our Low Cost A/D Converter using a PICAXE chip. Here is a data recording of a transit of Cassiopea A, which is a very powerful radio astronomy source. 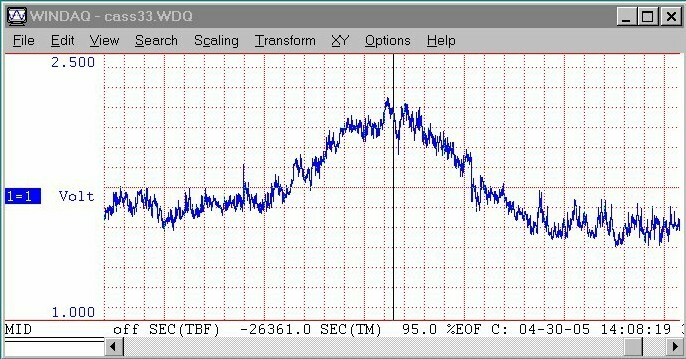 This particular trace was taken using a YAGI Beam Antenna built for UHF channel 37. A worthwile improvement to this project would be to build a Low Noise Amplifier (LNA) and insert it between the antenna and the tuner to improve sensitivity.